Classical Duets For Trumpet is a one of a kind collection dedicated to the young musician. 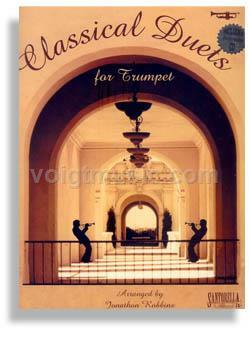 This Santorella Publication features an assortment of classics specifically chosen for their range and playability. Derived from the original piano masterworks of many great composers, these light classical pieces are magnificently transcribed examples of creative genius. Classical Duets For Trumpet published by Santorella Publications is edited and arranged in accommodating keys for the advanced beginner and graded to the intermediate level. Every piece is a potential sight reading exercise and highly recommended for daily practice sessions. The accompanying CD is recorded in a “music minus one” fashion by studio musicians. The student can easily isolate one track and actually play along with Chris Tedesco, one of the most successful trumpet players in the Los Angeles studio circuit today. Classical Duets from Santorella Publications is also available for clarinet, alto sax, flute, trombone or violin. Song titles include: Minuet (From, Minuet in G) • German Dance (No. 3 From, Twelve German Dances) • Minuet (From, Minuet in Bb) • Haydn, Promenade • Gretchaninov • A Little Piece • Schumann • Song Without Words • Jadassohn • Minuet • J.S. Bach • Bouree (From, Water Music) • Handel • Berceuse (Op. 2, No. 5) • Nevin • Sonatina • Andre • Le Petit Rien • Couperin • The Poor Orphan • Schumann • Enchanted Garden • Volkmann • The Clock (Op. 62, No. 2) • Kullak • Carefree • Turk • Symphony No. 40 (Theme from the First Movement) • Mozart • Allegretto • C.P.E. Bach • Pastorale • Burgmuller • Carnival • Couperin • The Chromatic Polka • Kohler • Spinning Song (Op. 14, No. 4) • Elmenreich • Cradle Song (Op. 62, No. 5) • Kullak About Chris Tedesco Chris Tedesco has distinguished himself as a soloist, chamber artist, orchestral & commercial trumpeter in Los Angeles for over 20 years. His early classical training included studies with Chuck Lirette of the Buffalo Philharmonic and college training with Gilbert Johnson, (former principal trumpet of the Philadelphia Philharmonic) at the University of Miami in Florida. Chris Tedesco’s road travels included concert tours with the Glenn Miller Band, Tommy Dorsey Orchestra, but it was Cruise Ships that brought him to Los Angeles in 1987. Chris Tedesco can be heard on the movie soundtracks of Finding Nemo, Road to Perdition, Boat Trip, The Mexican, Best in Show, Ring of Fire, After the Storm, Durango Kids, Winchell, Absolute Power, Star Trek - First Contact, Nixon, Stonebrook, Heaven and Earth, Cool World and Lorenzoâ€˜s Oil. On the small screen you can hear his solo Trumpet on the theme to the hit TV show “The District” along with many national TV commercials. Chris Tedesco has recorded with Joe Cocker, Natalie Merchant, Ellis Hall, Royal Crown Revue, Pat Boone, Cher, Brian Setzer, Dwight Yoakum, Juan Carlos Quintero, Thom Rotella, Jump with Joey, Leslie Paula, Boom Shaka and forThe Disney Afternoon.